Alexander Weimann leads five internationally renowned soloists, a full baroque orchestra, 3 trumpets, and timpani in a performance of J.S. Bach’s Magnificat. Written for Christmas Vespers in 1723, this version includes four rarely heard and delightful inserts that illuminate the Nativity story. Join us for a fascinating new slant on a familiar masterpiece. The programme also includes Telemann’s concerto for three trumpets in D major (TWV 54) and Bach’s beloved Cantata 140 (Wachet auf). Upon the death of Johann Kuhnau on June 5th, 1722, a vacancy opened for the position of music director at the churches of St. Thomas and St. Nicolas in Leipzig. Two of the five applicants for that post composed the music for the present program: Georg Philipp Telemann and Johann Sebastian Bach. Given the immense legacy left by Bach, it may come as a surprise that he was not the first choice for the Leipzig cantorship. The town council selected Telemann first, but Telemann used his application to leverage a salary increase from his current employer and withdrew. Of the remaining candidates, Bach alone managed both to prove his suitability and, almost more importantly, to receive a gracious discharge from his current employer (Prince Leopold of Anhalt-Cöthen). Bach’s duties at Leipzig included supplying a fresh cantata for each Sunday as well as providing additional liturgical music for special occasions. On Christmas Day, 1723, Bach led the music at three church services; for the Vespers service at St. Nicolas, Bach crafted his largest vocal work to date, the Magnificat, BWV 243a in E-flat major. This Bach would later revise as the better-known version in D major, BWV 243. BWV 243a makes its association with Christmas clear by the inclusion of four interpolated texts important to the local liturgy in Leipzig. Bach wove in this motley collection of texts—“Vom Himmel Hoch”, “Freut euch und jubiliert”, “Gloria in excelsis”, and “Virga Jesse”—likely because of a precedent set by his predecessor Kuhnau to deploy them in works for Christmas Day. One will note the much lighter use of instrumental resources for these movements, separating them dramatically from the Magnificat text proper. Bach’s most concentrated period of cantata composition occurred in the first three years of his cantorship at Leipzig (1723-26), as afterward, he had a recyclable corpus of works and did not need to supply many new ones. It was for the rare occurrence of a 27th Sunday after Trinity in 1731 that Bach wrote Wachet auf, ruft uns die Stimme (BWV 140). (Easter fell very early that year.) This work,as in the case of many Bach cantatas, takes both the tune and the text of an existing Lutheran chorale as its basis. The seven movements correspond to the seven stanzas of a hymn by Philipp Nicolai (fl. 1599). To represent the symmetry of the cross, Bach presents the hymn text verbatim and quotes the original tune in movements 1,4, and 7. The first movement is a chorale fantasia: the soprano voice sings the tune in long tones throughout (in a cantus firmus, or fixed voice), around which Bach composed the fabric of the music. The text describes a metaphorical wedding between Christ and the souls of the faithful, whom the night watchman of Jerusalem calls to wake. The march-like rhythm that begins the piece references the approach of the noble Jesus. After a few bars, the oboe and the violins begin to “chase” each other with a rhythm that anticipates each beat, building the listener’s sense of expectation and fostering a sort of breathless excitement. This gives way to a wash of running scales representing the excited inhabitants of Jerusalem rushing forth at the watchman’s call. These rhythmic features permeate the movement, creating a sense of blissful anticipation throughout. The intervening movements 2,3,5, and 6 all draw upon the ingredients of Italian opera—recitative and the da capo aria. An unknown author has paraphrased Nicolai’s texts here to accommodate the poetic demands of these genres. The arias, movements 3 and 6, are both love duets for the soul and Jesus. The first of these shows their courtship, and the unusual violino piccolo—a small violin tuned a third higher than normal—provides the accompaniment. Since the violino piccolo part does not ascend beyond Bach’s usual violin range, its use here may be more symbolic than practical: It may suggest an outdoor serenade, given the portability of the instrument. The second aria provides a confirmation of the union of the soul with Christ. The recitatives act as introductions to each aria. In the case of the second of these, movement 5, the speaker is actually Jesus, who is framed by a “halo” of strings to differentiate him from the narrative voice heard in movement 2. Telemann, before relocating to Hamburg and applying for the cantorship at Leipzig, worked in Frankfurt (1712-1721). It was during this period, in 1716, that he composed the Concerto for Three Trumpets (TWV 54:D3) as the overture to a celebratory serenata. The opening Intrada suggests French influence with its heavily dotted rhythms, reminiscent of the style of a French ouverture. Telemann once commented that his concertos “reek of France”, though as this example shows, he tailored many different fashions to cultivate a highly individualized style. The work’s four-movement format (slow-fast-slow-fast) recalls the church sonatas and concerti grossi of Arcangelo Corelli, as does the fugal opening to the second movement. The valveless trumpet of this period required special considerations as a melodic instrument, as it could only play the tones of the natural harmonic series in a single key. Only by playing very high can one execute a scale. The instrument is thus taxing to play, and consequently, the strings and oboes in this work take much of its substance. The lovely third movement stars the oboe as the soloist, both to give the brass a little respite and to allow for the use of a contrasting key as is customary for central slow movements in concertos. 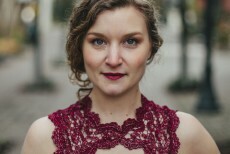 Praised by The New York Times for her “radiant sweetness” Molly Quinn has appeared as a soloist with many classical and early music ensembles including Apollo’s Fire, The Portland Baroque Orchestra, The Knights NYC, The Bang on a Can All-Stars, The Clarion Music Society, The Carmel Bach Festival, Catacoustic Consort, The Staunton Music Festival, and Trinity Baroque Orchestra. Ms Quinn is a frequent performer with New York’s early music ensemble TENET, and is featured throughout their discography. Molly has been a frequent collaborator with Music at Trinity Wall Street. She is a featured soloist on their 2013 GRAMMY®-nominated recording of Handel’s Israel in Egypt (Musica Omnia, 2012). Ms Quinn has also garnered acclaim for her work crossing genres in classical, folk, and contemporary music. Molly was dubbed “pure radiance” by the Los Angeles Times for her work with The Bang on a Can All-Stars in Steel Hammer. A frequent featured soloist with Sir John Eliot Gardiner and the English Baroque Soloists, she has made four recordings with the group, including Bach’s Easter and Ascension Oratorios – the vehicle for her BBC Proms debut − and the October 2015 release of Bach’s Mass in B Minor. Ms. Bragle has performed with the Houston, Indianapolis, Pacific, and Colorado Symphonies, National Arts Center Orchestra, Calgary Philharmonic, Philharmonia Baroque Orchestra, Music of the Baroque, Orchestra of St. Luke’s, Orchestra of the Age of Enlightenment, Orchestre Révolutionnaire et Romantique, Tafelmusik Baroque Orchestra, Les Violons du Roy, and Apollo’s Fire. Highlights of her 2016/17 season include appearances with Milwaukee Symphony, Cincinnati Symphon, St. Paul Chamber Orchestra, American Bach, and Early Music Vancouver. Bragle also performs this season at the Winter Park and Carmel Bach Festivals, with St. Thomas Church Choir of Men and Boys in New York, University Musical Society, Voices of Music, and Catacoustic Consort. Opera roles from recent seasons include the title role in Handel’s Susannah, Dido and the Sorceress in Purcell’s Dido and Aeneas, Dardano in Handel’s Amadigi, Amastre in Handel’s Serse, Speranza in Monteverdi’s L’Orfeo, Ippolita in Cavalli’s Elena, and Elpina in Vivaldi’s La Fida Ninfa. In addition to her recordings with the English Baroque Soloists, Ms. Bragle has made several with Apollo’s Fire: Mozart’s Requiem (Koch), Monteverdi’s Vespro della Beata Vergine (Avie), L’Orfeo(Eclectra), and Handel’s Dixit Dominus and Ode for the Birthday of Queen Anne (Avie). Visit Meg Bragle at www.megbragle.com. Baritone Jesse Blumberg enjoys a busy schedule of opera, concerts, and recitals, performing repertoire from the Renaissance and Baroque to the 20th and 21st centuries. His performances have included the world premiere of The Grapes of Wrath at Minnesota Opera, Bernstein’s MASS at London’s Royal Festival Hall, various productions with Boston Early Music Festival, and featured roles with Atlanta Opera, Pittsburgh Opera, Utah Opera, and Boston Lyric Opera. Recital highlights include appearances with the Marilyn Horne Foundation, New York Festival of Song, and Mirror Visions Ensemble. He has performed major concert works with American Bach Soloists, Los Angeles Master Chorale, Boston Baroque, Oratorio Society of New York, Apollo’s Fire, and on Lincoln Center’s American Songbook series. His current season includes debuts at Arion Baroque, Early Music Vancouver, and Opera Atelier, guest appearances with the baroque string band ACRONYM, and leading roles at the 2017 Boston Early Music Festival.